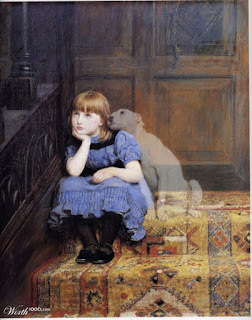 Animal lovers the world over cannot help but be touched by this painting which appears to show a forlorn little girl and the ghostly image of her deceased dog, still loyal and comforting even from beyond the grave. The portrait speaks to man's love and devotion to our canine companions and their loyalty and unconditional love. It's a touching image...almost bittersweet...which reminds us that our furry friends never truly leave us, in spirit or in memory. So profound is the image, that it is constantly used over and over again to illustrate articles and websites dealing with the subjects of lost pets, grief in dealing with that loss, and even more paranormal topics, such as ghost animals. It's a beautiful image alright...but not exactly what the original artist had in mind! The image above is a digital manipulation of a painting by Briton Riviere called Sympathy. As you can see in the original (to the right), the 'ghost' dog isn't a see-through apparition at all, but a real, living dog. It was painted in 1877 and according to the artist, the little girl is modeled after his own daughter, Millicent, while the dog, a bull terrier, was owned by a man who often supplied the artist with dogs. 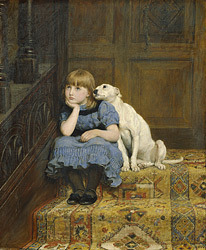 The subject is of a little girl who was sent in disgrace to sit on the stairs while her pet dog came up to comfort her. It wasn't until 2007 or 2008 that someone using the name LissiS uploaded the digitally enhanced 'ghost' dog image to Worth1000.com, an image alteration and contest website, and a whole new audience was found for this wonderful painting. More strange, spooky, and creepy art from Theresa's Haunted History of the Tri-State!